The Women's Ascent 700 2018 Sleeping Bag from Rab, is a mid-weight, down filled sleeping bag that is brilliant for outdoor use in many conditions for wherever your outdoor adventure takes you! 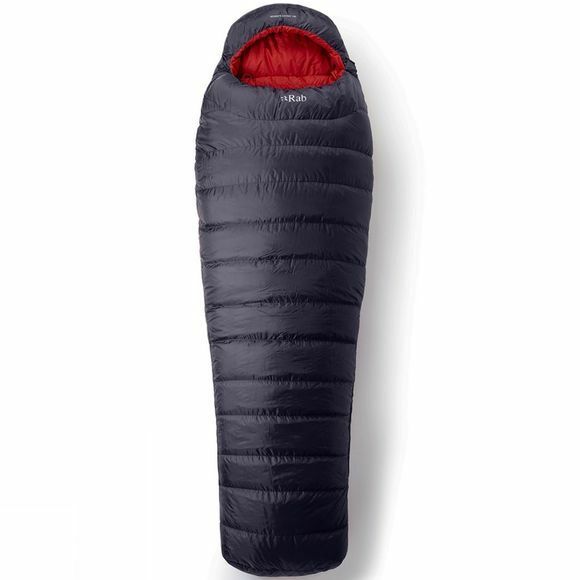 The sleeping bag is filled with 650 fill power hydrophobic down meaning that it is well insulated and warm for whatever conditions you are facing with a comfort limit of -8.5 degrees. The trapezoidal baffle design from Rab also adds to making the sleeping bag as warm as possible meaning it eliminates cold spots and keeps you as warm as possible as well as having an internal collar and hood drawcord. Anatomically designed for women, the wide mummy fit optimizes comfort while the close-fitting neck baffle design and angled foot box ensure either end of the sleeping bag remains snug. This means you can make the sleeping bag fit around you as best possible for a comfortable experience wherever you may be camping. The glow-in-the-dark puller on the main zip is especially useful when tucking yourself in after a night around the campfire and the compression stuff sack, cotton storage sack and anti-snag zip guard all come together to increase the easy transportation and life of the bag.